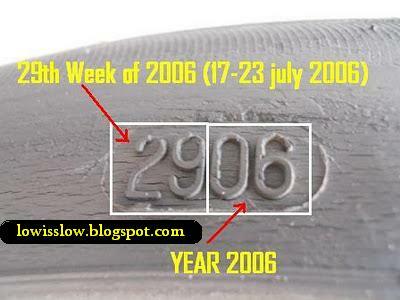 Did you know what is the meaning of the "Code" printed on the side wall of the tire. Sometimes we do not know what kind of tires suitable for our use. Usually we just tell the size of the tire to tire shopkeepers, and some just say "change tire" verbally and let the shopkeepers make decisions what tire to use. Inappropriate use of tires with the weight of the vehicle and the speed can lead to tire failure to function properly and may cause accidents. 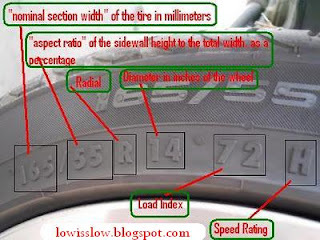 So, here i would like to share with you what is the meaning of the "Tire Code". Just take a few minute to read this article and it would save your money and the most important is your safety. The "Code" or it standard name "The ISO Metric tire code" is a national tire standards influenced by the The European Tyre and Rim Technical Organisation (ETRTO) and the Tire and Rim Association (TRA) . 165 - The "nominal section width" of the tire in millimeters; the widest point from both outer edges.